About 30 species, particularly numerous in Mexico and in the southwestern United States. scale scabrous and sparingly long-ciliate on the keel. B. hirsuta Lag. Var. Cienc. y Litter. 2: Part 4, 141. 1805. Culms 6'-2o' tall, erect, simple or sometimes sparingly branched at the base, smooth and glabrous. 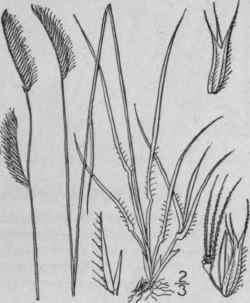 Sheaths mostly at the base of the culm, the lower short and crowded, the upper longer; ligule a ring of short hairs; blades 1'-5' long, 1" wide or less, erect or ascending, flat, scabrous, sparingly papillose-hirsute near the base, especially on the margins; spikes 1-4, Y-2' long, usually erect or ascending, the rachis extending beyond the spikelets into a conspicuous point; spikelets numerous, 2 1/2-3" long, pectinately arranged; first scale hyaline, shorter than the membranous second one, which is strongly papillose-hirsute on the keel; third scale pubescent, 3-cleft to the middle, the nerves terminating in awns; rachilla without a tuft of hairs under the rudimentary scales and awns. In dry soil, especially on prairies, Illinois to South Dakota and Mexico; also in Florida. Bristly Mesquite, Black Grama; Buffalo-grass. July-Sept.
Atheropogon oligostachyus Nutt. Gen. 1: 78. 1818. 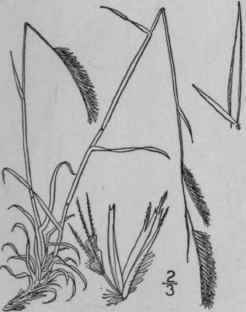 B. oligostachya Torr. ; A. Gray, Man. Ed. 2, 553. 1856. Culms 6' -18' tall, erect, simple, smooth and glabrous. Sheaths shorter than the internodes; ligule a ring of short hairs; blades 1'-4' long, 1" wide or less, involute, at least at the long slender tip, smooth or scabrous; spikes 1-3, 1'-2' long, often strongly curved, the rachis terminating in a short inconspicuous point; spikelets numerous, pectinately arranged, about 3" long; first scale hyaline, shorter than the membranous second one, which is scabrous and sometimes long-ciliate on 'the keel, and sometimes bears a few papillae; third scale pubescent, 3-cleft, the nerves terminating in awns; rachilla with a tuft of long hairs under the rudimentary scales and awns. On prairies, Wisconsin to North Dakota, south to Texas and Mexico. Blue or Common Grama, Buffalo-grass. July-Sept.